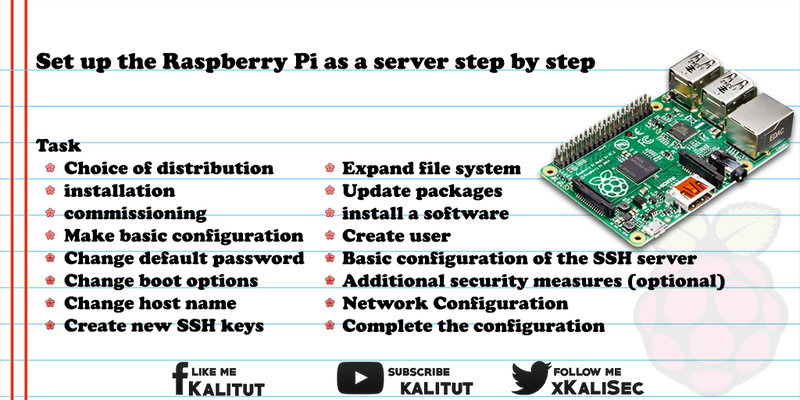 The following step-by-step guide is a suggestion to set up Raspberry Pi as a server. The order of the individual steps follows an internal logic. So a repeated reboots should be avoided and only take place if there is no other way. Of course you can also change the order or omit individual steps if you do not need them. The instructions provide that you can make the configuration via SSH. But this requires an active SSH server on Raspberry Pi. Of course, the configuration can also be done locally. With a server, one will usually opt for a minimal image, because any pre-installed software is redundant, unnecessarily consumes storage space and also includes performance and security risks. The first steps are to set the country, language, and time settings. Note: Depending on the distribution, there are different ways to make these basic settings. So under Raspbian there is the tool "raspi-config", with which the above settings can be carried out very comfortably. For safety reasons, the default password must be changed as soon as possible after the first commissioning. Usually immediately. In this case, only after the language settings, because then you have a German-speaking user interface, which simplifies the handling. The password of the user "pi" can also be changed via "raspi-config". The new password must be entered and confirmed "blindly". Raspbian Wheezy starts the console by default. Then you have to log in. Under Raspbian Jessie the graphical user interface is started by default, which we do not necessarily want. These boot options are best set with the tool "raspi-config". By default, a fresh image of a Linux distribution has a given hostname. In a server operation you might want to give an individual host name. It may not be enough. One should take another look at the hosts file. If there is still the old host name in it, then you have to change the file in this file too. At the latest, if you have changed the hostname, you have to create new SSH keys. First we delete all the files in which the keys are located. There are several of them. Nevertheless, a command is sufficient for deletion. It is not necessary to restart the system. However, one must note that after a new login via SSH, the identity of the system must be reconfirmed. If a Linux distribution has just been written to an SD card, then not all of the memory card will be used, only part of it. If you want to extend the file system to the whole memory card, then we recommend the menu item "Expand Filesystem" via "raspi-config". Subsequently, a reboot is mandatory. Note: After an "expand file system", a reboot must be mandatory. If you continue here without reboot, you can shoot the system. When rebuilding a system, it's a good idea to check the repositories that will later be used to package new and updated packages through package management. Depending on what requirements you make, adjustments may or may not be necessary. If you use a standard distribution like Raspbian, checking the package sources is not mandatory. They are mostly sensible. It looks different when you have an image from a foreign source. Here you should take a look. Then we perform the update of the package lists from the package sources. And then we load and install updated packages. Depending on the timeliness of the image or the distribution that can sometimes take a little longer. Depending on the distribution or image, it may not hurt to install a few packages. These are a few tools that will help you better use the system later. The installation is done individually. That means, if necessary, individual packages can be omitted or later installed. The following steps are only valid if no user has been set up yet. With Raspbian the user "pi" is already set up and therefore no further user has to be set up. It makes sense to set up another user for administration only if the "sudo" package was previously installed. Then the password must be entered "blind" and then confirmed. Here we check whether the following line is entered. If not, then this line must be added. Having set up a user for system administration is a good opportunity to test it by logging in. To do this, log in as "root" and as a new user. The next step is to configure the SSH server more securely. The following lines must be considered individually. In some cases, the parameters are already correctly preset. Others must be changed or added later. After the changes, the file must be saved and closed. Afterwards a restart of the SSH server is necessary, so that the changes are taken over. An existing SSH connection is not interrupted. If you have set up a user for system administration who is authorized to use "sudo" and can connect via SSH, then you can further improve the security of the entire system by deleting the password of "root". Before the configuration of the entire system is completed, it will still take care of the network configuration. However, this is to be determined individually. So you will usually set up a static IPv4 address for server operation. In one case or another, enable IPv6, which is recommended for a new setup. And if necessary, you will install additional network services, such as Avahi. The last restart. This is necessary to know that when you restart, everything really works the way you want it to.